Many people think that making home made gravy is too difficult, so they just keep using powdered gravy granules and stock cubes. Good gravy is actually really easy to make if you follow this recipe. Once you have proudly served up your own home made gravy with your next roast dinner, or sausages and mash, you’ll never go back to using stock cubes or gravy granules. There are two main recipes for cooking gravy. The first one is for when you are making a roast dinner and you can use the juices from the meat and the second version is for when you do not have a roasting joint. This is particularly good with sausages and mash, or pork or lamb chops. When you have roasted your chicken, lamb or beef (pork doesn’t work as well as you don’t get the same juices, but it’s worth a try, or use the second method), put the meat or bird onto a warmed plate and cover it in a tent of foil while it rests. It will be fine for at least thirty minutes as the juices in the meat will help keep it moist. Take the tray that you cooked the meat in and place it on a direct, low to medium heat. Make sure you cook your meat in a dish or tray that can be put over a direct heat – a heavy metal roasting tin is best. Carefully drain off all but about two tablespoons of the fat from the tin – keep it, as this is the perfect kitchen standby ingredient for making delicious roast potatoes. With the tin on the heat, carefully add in two tablespoons of flour – make sure it is lump free flour using a sift as this makes it easier to make lump free gravy. In preference to type of flour there is no rule; however, plain flour is considered the best amongst gravy makers. Stir the flour around in the remaining hot fat for about a minute, and then add in a good glug of red wine - a good glass or two, if you’re making gravy for more than two people. Stir the wine into the floury paste, making sure you scrape up all the flavourful bits cooked into the pan from the meat or chicken. Let this cook for a few minutes, stirring all the time. You can then add some water or stock, but the best way to loosen the gravy is to add some of the cooking water from whatever vegetables you are cooking. That way, you keep the nutrients and don’t add anything fake to your delicious gravy! You can serve the gravy as it is, or add in a teaspoon or two or redcurrant or cranberry jelly to add a little sweetness. 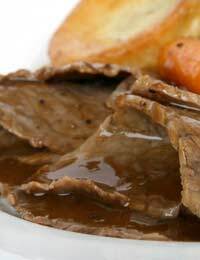 You can make wonderful onion gravy without needing to have a roast joint for the juices. Just fry two or three finely chopped onions in a heavy based saucepan, with a little olive oil and butter. Let the onions cook for as long as possible so they get lovely and sweet – at least twenty minutes, stirring every few minutes so they don’t catch. Then add in a couple of spoons of flour and stir it into the onions. Now you need to add about three quarters of a pint of good quality stock – vegetable bullion is good, and keeps the gravy vegetarian, or a chicken stock adds extra flavour. Keep this mixture bubbling over a low heat for a while to thicken. You can add herbs, red wine and seasoning, if required. Delicious with grilled meats and sausages.